Nestled off of the Boylston Highway between Mills River and Brevard. 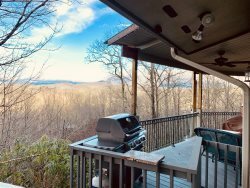 The house is about minutes from Brevard and 15 minutes from Asheville Airport. 30 minutes from Asheville. As the Mother Goose poem states “And they all lived together in a little crooked house.” Pops Place is that little crooked house that sits on a fish filled pond. This is truly a house of character, as it was once a tobacco barn that was located in the middle of where the pond is now. The large windows on both levels were once French doors and the history of the house goes on from there as each piece was put together by the owner’s father (Pops). The house sits above a pond filled with trout for you to fish, there is a paddle boat for you to utilize, and a dock to jump off of to enjoy a swim in the pond as well. There is also a hiking trail right next to the property. Pops Place also has an open deck to enjoy the evening cool air. Peace, quiet, and privacy as there is only one neighbor across the pond. This is truly a house that has a lot to offer a family for a summer vacation. Fishing pond stocked with Trout (limited to catching just enough fish for an evening dinner), but please, NO catch and release.